What is the story behind the common garden pagoda tent? Discover how this design archetype has developed from the very beginning of human existence! 2018 is a significant year in the history of the design archetype that has been alongside humans since their earliest origins: the pagoda tent. When the human civilisation was still nomadic, quickly creating a safe shelter for the night was essential for survival. This is how our ancestors invented what resembles the tents of the tribes currently living in the deserts, or the Indian tribes, using the easily transportable wood and leather. Over the centuries the armies felt the same need for portable shelters. They transformed the common tent in what we could already call a "gazebo", a tent with vertical walls. This was essential to provide shelter for the military camp and they could customise the sheets with their own colours and banners. When people transition to a sedentary form of settlement, the temporary shelter is transformed into a permanent structure and often becomes a place of spiritual meaning. In the naturalist religions, such as the Eastern ones, the tent is the meeting point between the man and the cosmos that manifests itself through the lush surrounding nature. Similarly, the architects attributed to this type of structure the same function of connection between man and nature, in this case in the garden of the house. This became prominent especially at the beginning of the 20th century. The gazebo thus becomes a place with a view where you can spend pleasant moments in harmony with nature. 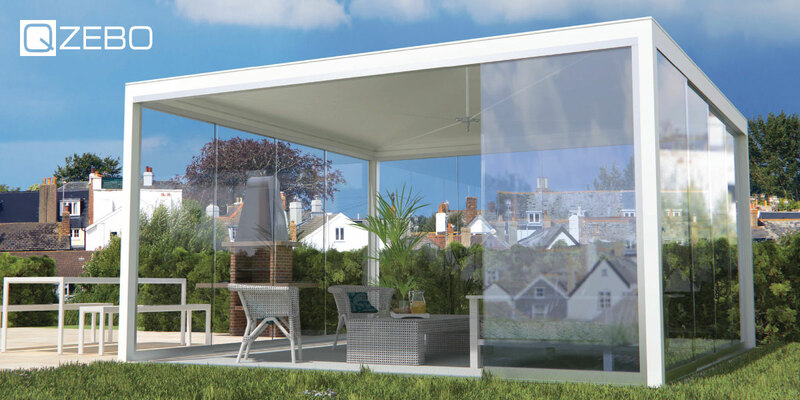 In the 21st century, the new materials that came into play revolutionised the concept of the gazebo forever. These were plastic materials and aluminium, which until then was of limited availability and more precious than gold. In 1990 the Italian company Giulio Barbieri S.r.l. reinvents the gazebo by combining the ancient functions into a single structure made of aluminium and PVC sheet, suitable for both temporary and permanent use. The practical assembly system and the high resistance of the materials have made it possible to use the tent in entirely new ways - for events and celebrations, thus creating an all-new market - that of rental. 2018 marks a further evolutionary leap in the history of this item that has always been present in our existence. The atavistic shape that until then had been proposed by replacing wood with aluminium and fabric with PVC sheeting has been rethought by testing the true nature of these new materials to bring the form to the purity of an archetype: the cube. 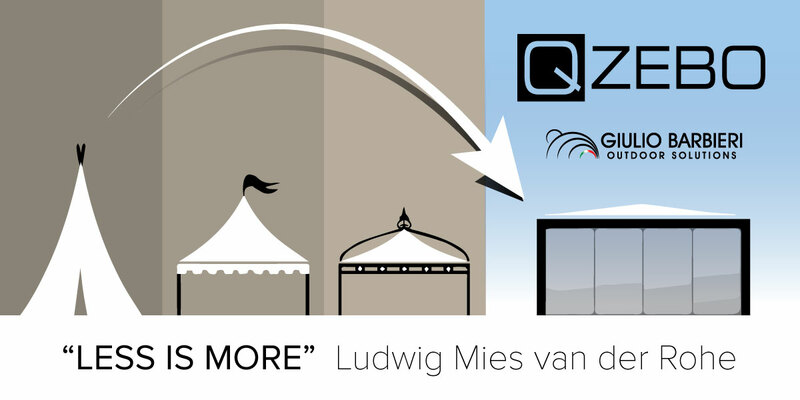 Hence the name QZEBO, attributed to this new model of gazebo. The dome is flat, almost invisible, and the fabric binds to the structure with extreme elegance, disappearing into a profile made thanks to modern extrusion systems. The result is a new, extremely clean and simple shape, which deserves its place in the history of modern outdoor furniture design.